In his “Twilight Zone” column this weekend,” Haaretz‘s Gideon Levy describes his visit to the homes of Palestinian assailants who carried out attacks last week. (“For Families of Palestinian Assailants, Grief, Pride and Unanswered Questions,” Sept. 23). Last Friday, he joined his father for prayers in the mosque; after lunch, he told the family he was going to visit his cousins. Nothing in his behavior betrayed what was about to happen. He left his cell phone at home — but that was not unusual, his father says. He didn’t always take it with him. Did nothing at all hint at what was to come? Admiration for “martyrs,” therefore, was not foreign to Rajabi. So is it really true that “nothing in his behavior hinted” at his planned attack? 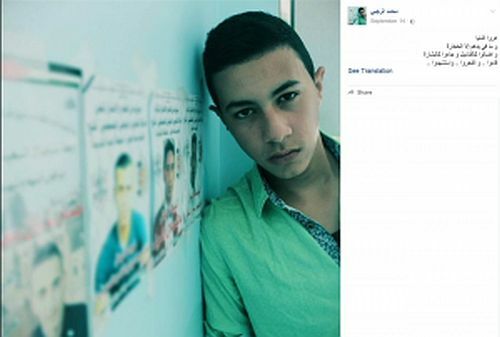 On September 14, 2015, two days before he left to carry out his terrorist stabbing, Rajabi posted on his Facebook page a picture of himself posing beside a row of photographs of “martyrs” (as Palestinians refer to terrorists who are killed). This also served as his profile picture. 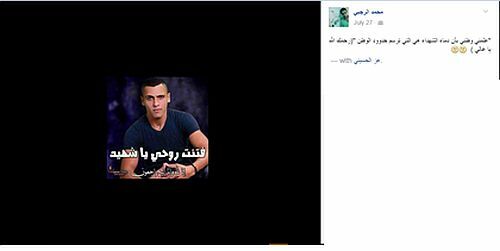 As even Levy mentioned, two days after Rajabi’s terrorist attack, two other members of his family went to carry out a stabbing attack in the Cave of the Patriarchs. They were shot and killed. So what prompted them go out and stab soldiers? Only God knows? 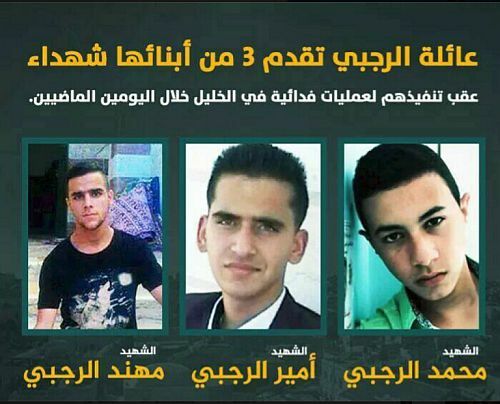 A poster of the three “shahids” from the al-Rajabi family who carried out “acts of heroism” in Hebron. Gideon Levy chose not to respond.